When I first started knitting, I tried to read Elizabeth Zimmermann’s books and got frustrated. She spends more time talking about knitting than handing the reader neat little patterns, and the patterns themselves are very chatty — some might say a little pithy — and rely on the knitter’s experience to get them sorted out properly. If you are an inexperienced knitter you might find this scary or even, as I did, somewhat annoying. Fast forward a few years of knitting, and now I’m really enjoying myself. First I read Knitter’s Almanac, now I’m in the middle of Knitting Without Tears. She’s pretty amazing, I’m glad I’ve kept going back because I think now I understand where she’s coming from.In the spirit of Mme. Zimmermann, I started knitting a hat to blow off steam during last-minute wedding preparations. Here is the pattern (! ), composed at restaurants, in traffic, and in a hotel room. Gauge: To paraphrase Mme. Zimmermann, babies come in multiple sizes, so this is the rare event where gauge doesn’t matter much (in my opinion.) A perfect rash of babies are appearing in the rarefied circles in which I move, so I assume some baby can wear this hat. For the record, according to my calculations, I got about 15 stitches and 20 rows over 4″ on this puppy. This makes a small, chubby hat, stretching to small baby circumference. I’m going to play with bigger gauges (Malabrigo Chunky, of course) when life quiets down. Yarn: I bought some ShiBui Knits Highland Wool Alpaca at Knit/Purl in Portland, Oregon two weeks ago. (Did I mention I’ve been pretty busy lately? Also, they were so sweet there, it deserves a separate post.) It used, oh, 100 yards? Maybe? Color is Peacock, and it’s a brilliant blue-green that my picture does not enhance in any way. Needles: size 10.5 DPNs and circular. 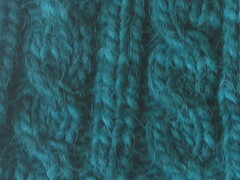 KBF: Knit into back and front (embiggens stitch). C2RP: Slip two stitches onto cable needle, hold to front. P1, K2, K2 from cable needle. Great acronym, huh? 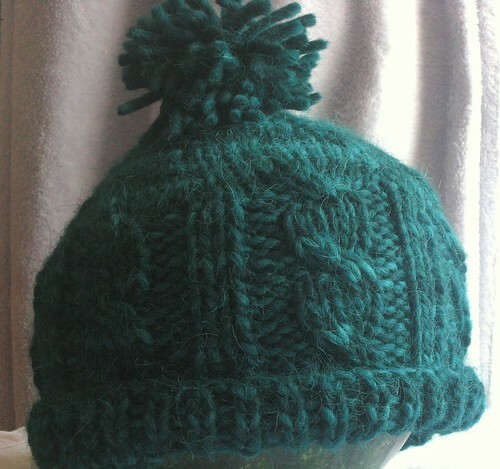 I decided I wanted to make a cable-knit hat. I had 66 stitches on the needles, and I liked this 6-part construction thing, so I unvented an 11-stitch cable pattern. It looks like this. I think the hidden purl stitch in the center makes it especially round and pretty, but I can be pretty stubborn about not ripping back and making 11-stitch cable patterns 10-stitch cable patterns. Row 1: K1, P2, C2RP, P2, K1. Rows 2-6: K1, P2, K2, P1, K2, P2, K1. I got the crown construction idea from Hip Knit Hats. Cast on 12 stitches using Figure 8 Cast-On. Put 4 stitches on each DPN. Row 1: (KBF, K1) 6 times (18 stitches total). Row 3: (KBF, K2) 6 times (24 stitches total). Row 5: (KBF, K3) 6 times (30 stitches total). Row 7: (KBF, K4) 6 times (36 stitches total). Row 9: (KBF, K5) 6 times (42 stitches total). Row 11: (KBF, K6) 6 times (48 stitches total). Row 13: (KBF, K7) 6 times (54 stitches total). Row 15: (KBF, K8 ) 6 times (60 stitches total). Row 17: (KBF, K9) 6 times (66 stitches total). Row 19 (cable prep): K1, P2, K2, P1, K2, P2, K1. Row 20-26: Work cable panel. Row 27-33: Work cable panel again. Row 34-40: Work cable panel again! Work k1, P1 ribbing for 1.5″ or until sick of hat. BIND OFF VERY, VERY LOOSELY in rib. Make a fat pom-pom. Attach to hat. Weave in ends. Find a fierce baby to wear hat. Free Fierce Baby Hat Pattern!